Innovative French fine dining in Causeway Bay, Hong Kong. What is it: A beautiful, welcoming space with a contemporary feel, serving up classic French dishes with Asian influences, and executed with skill and flair. With Olivier Elzer, former head chef at the Mandarin Oriental’s Pierre Restaurant and L’Atelier de Joël Robuchon, as the chef and co-founder, this is to be expected. The setting: It’s not just the menu that takes its inspiration from the seasons, but the restaurant’s interior design and décor too. With its use of wooden floors, neutral tones and rusty reds, the main dining area is themed around ‘Autumn’, while the private dining room is a cosy and elegant ‘Winter’. You’ll find ‘Spring’ in their beautifully bright and light green house room (we loved the mosaic-tiled floor and ceiling lights by Tom Dixon), which leads out to a large ‘Summer’ garden terrace with plenty of lounge seating and a soon-to-open bar. The menu: Seasons offers an a la carte menu with half and full portions available as well as three, four and five-course set lunch menus priced between $288 – $488 and a four-course set dinner menu priced at $588 per person. Specially prepared menus for the whole table are also on offer by Chef Olivier. The drinks list boasts an impressive array of wine, with most coming from France. The food: We were seated at the chef’s bar table in the main dining area, which is a long bar counter that overlooks the open kitchen. We began our press lunch with a French favourite; pink radish with Guérnade salt and homemade garlic and parsley butter – an ideal bite-sized “finger food” to get the taste buds prepped and ready. 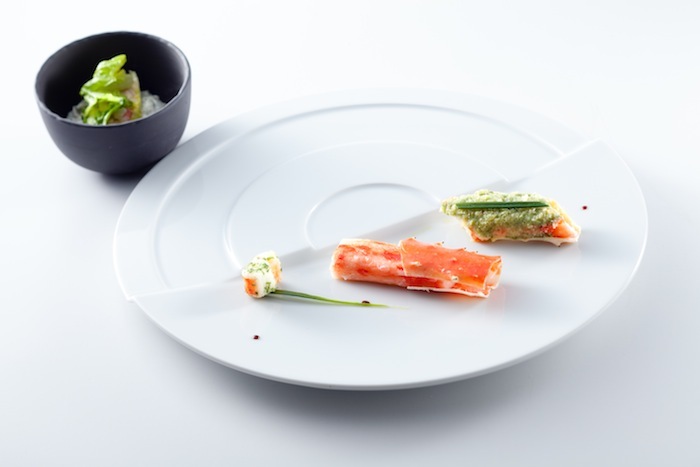 The king crab pentad showcased five different methods of preparation, including a delicate and tasty ‘crab wrap’ using meat from the elbow and served with a zingy ginger mayonnaise. The chilled tamarillo gazpacho topped with basil ice cream and rich brousse cheese was a balanced and refreshing dish and a touch sweeter (much to our liking) than traditional gazpacho. The grilled langoustine with risotto venere and masala butter was the firm favourite out of an array of impressive dishes. Pan-seared on the Japanese teppan grill, the fleshy langoustine was cooked to perfection. 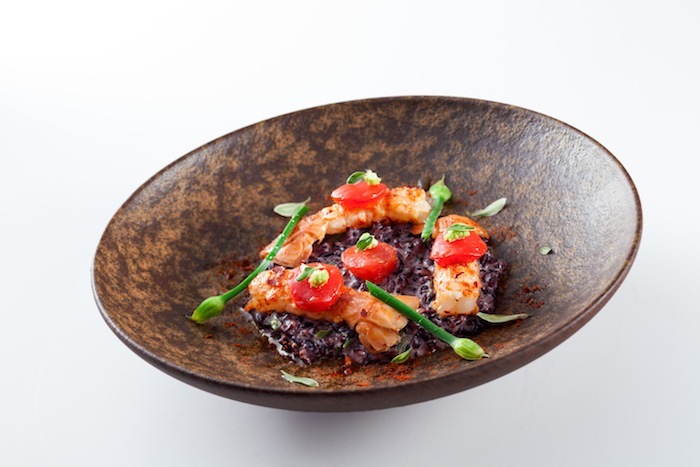 Its fruity curry flavour blended harmoniously with the rich and creamy black risotto – we couldn’t get enough of it. 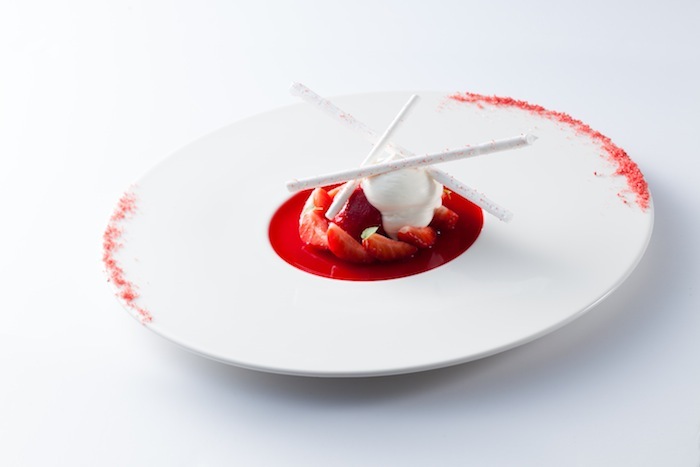 To finish, we were served the delicate and artistically-plated strawberry jelly with mascarpone cream and raspberry sorbet. Hibiscus syrup is blended with the strawberry juice to create an intense strawberry jelly, which is placed on a morsel of meringue and crowned with rich mascarpone cream, resulting in a truly refreshing summer delight. 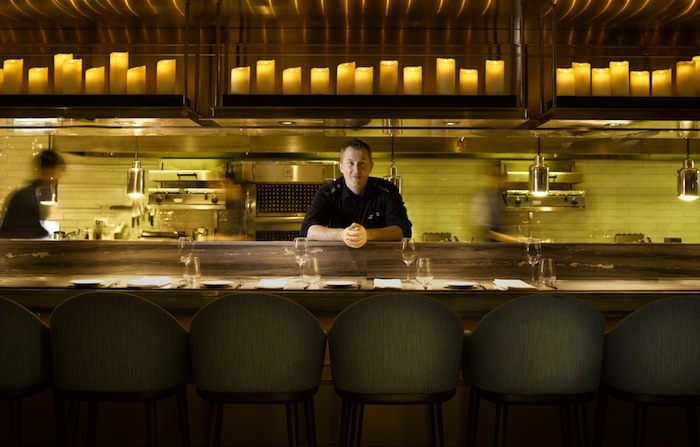 Overall: A welcome change from Hong Kong’s hugely over-priced fine dining scene, Seasons by Olivier E is French fine dining without the trop cher price tag. It places an emphasis on intimacy over austerity, comfort over conformity and quality over all else. 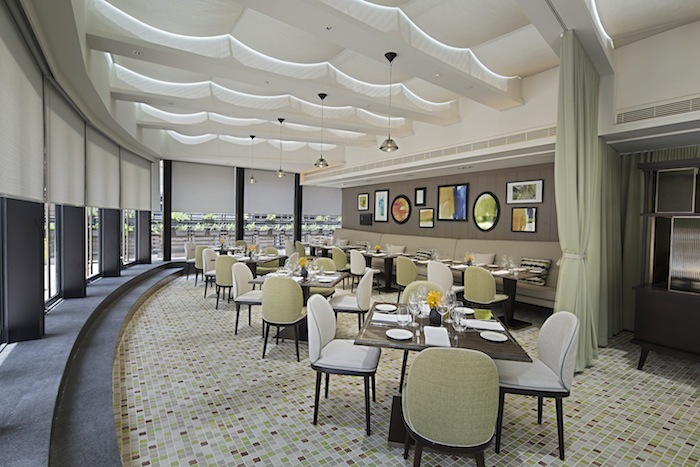 Chef Olivier Elzer uses only the freshest seasonal ingredients, so expect an ever changing, innovative menu. Open daily from 12pm – 2:30pm and 6pm – 10:30pm.